Powell Gardens has a number of programs established for scouting-type organizations, from guided badge programs, Seed Starter field trip programs, volunteer opportunities, self-guided tours and scavenger hunts. In addition, they have a variety guided field trips as well. While it appears that Powell Gardens has not yet developed a program specifically for American Heritage Girls, it seems likely that they would be willing to work with a local Troop. Contact the Youth Education Department for more information and scheduling. Gardening and Plant Science, Insect-a Inspect-a, Nature and Wildlife, and possibly Our Feathered Friends are all candidates for a Powell Gardens outing. Be sure to let us know what you work out! Saturday, May 18, 2:00 – 3:00 p.m.
Powell Gardens’ Kids’ Club hosts fun activities for children 5-12 spring through the fall. Monthly programs will feature guided walks and behind-the-scenes tours with plenty of opportunities to get up close and personal with the plants and bugs that inhabit the Gardens’ natural world. The Kids’ Club will meet from 10-11:30 a.m. on the second Saturday from April through October. Parents must accompany children ages 7 and under. New Kids’ Club members will receive a T-shirt. All members receive a great program, a kid’s e-newsletter and discounts in the gift shop on meeting days. Join our special guest, the Midwestern Bee Keepers group, for a special program on one of our favortie insects, the Honey Bee! Learn about bees and how important they are in the garden. Plus you’ll get a chance to taste some local honey. Back by popular demand! Join us for a guided hike on the Byron Shutz Nature Trail. We will look for native wild edibles and talk about their uses. Take a guided walk through the Nature Connects exhibit. July is hot so we are going to staying cool with an ice cream social. We will pick fresh berries from the garden and use them to top our ‘baggie’ ice cream. Come prepared to play in the fountain too! Take advantage of your exclusive club membership with VIP treatment during the Festival of Butterflies. Show your club card and get an express pass into the Butterfly Conservatory and get a special tour of the butterflies. September is a great month to study and collect insects. We will learn about these incredible animals and the head into the gardens to catch some! This one will be the FIRST Saturday in October. Plants and animals alike are preparing for winter. We will take a look at how plants prepare for the winter months. Plus, we will make a colorful fall craft to take home. Have a craving for brighter colors? Satisfy it with a visit to Powell Gardens! The horticulture team has brought out the most vibrant cool-season blooms to create a spectacular conservatory exhibit. 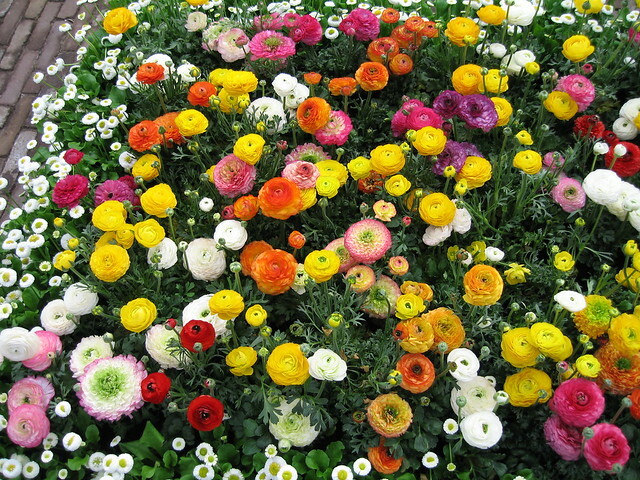 You will see ranunculus, dianthus, forsythia and other favorites in every color of the rainbow! The exhibit is open through March 10. This outing is a way to address Gardening & Plant Science, naturally, but the garden designs are also applicable to Artastic and History’s Canvas. It took a bit to decide how to describe this site, because it has several interesting features. Nature’s Notebook is collecting data on when and where plants and animals are observed throughout the country. You can see where sightings have been made, map where species are found, correlate climate data, and explore the timeline of a species’ presence in your area. Best of all, you can help! Want an indoor way to participate? You can help transcribe historical data, too. Education materials are available, too. There are so many ways you could incorporate this into your Troop programming. Use the visualization tool as part of the Plant Science or Zoology badges. Turn a campout or hike into an observation day (Women Scientists?). Organizing a larger observation effort might make for a good Harriet Tubman, Dolley Madison, or Stars and Stripes project. What other ideas do you have?